With a population around 30 000 San Marino has the status of a republic and claims to be the oldest country in the world because of some 1700's history. On September 3- 301, San Marino begins to exist as independent of the Roman province, which continues through the centuries until today. San Marino is a republic, extending 61 square miles and is the capital town. 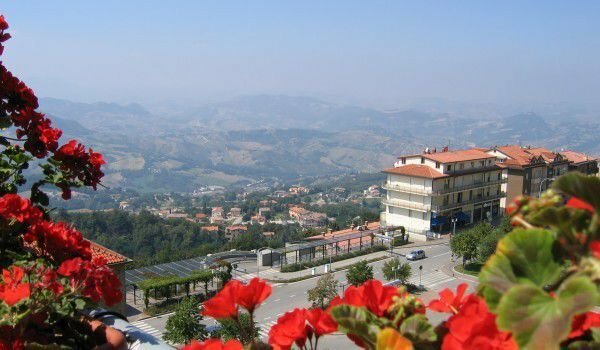 San Marino is located in the northeastern foothills of the Apennines of Tuscany, Italy, on the slope of Mount Titano(783 m), 18 km from the Adriatic Sea. About 10 km away, Rimini is a seaside resort, where the nearest airport is. 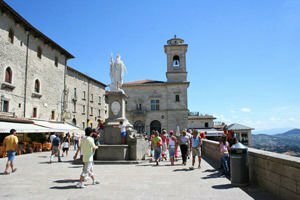 In the city of San Marino does not have many options for accommodation, so most tourists choose Rimini accommodation, which is even cheaper and is on the coast. San Marino is one of the smallest countries in the world. It is the third smallest European country after the Vatican and Monaco. San Marino is 20 times bigger than Monaco and is half the size of Liechtenstein. San Marino is surrounded by Italy, which is why the republic is dependent on the economic, commercial and cultural attitude of the Italians. The people of San Marino speak Italian pretty well. According to legend, San Marino was founded 301 by Christian stonemason Marino, who managed to escape from anti-Christian Roman Empire of Diocletian. Coming from Dalmatia, Marino reached the top of Mount Titano and there organized a small group of people- followers of Christianity. In San Marino there are several cities that are industrial centers and are not as exciting as the capital of San Marino, located on Titano. The San Marino Historic Centre and Mount Titano historical center of San Marino is entered in the list of World Heritage SItes by UNESCO in 2008. The tour of the historic center is quite an exciting experience. It is small and has only a few streets on which it is possible to drive a small car. Undoubted attractions of San Marino are the three towers, which are medieval castles and towers. The largest and oldest of them is the Guaita Fortress, built in the 11th century. It and two other towers, fortresses, which were built after Guaita - Fratelli De La Montale and the tower, surround the entire city of San Marino. Guaita is used as a prison for some time and today its dungeons are extremely attractive for tourists. This fortress, together with the remaining 2 castles are an integral part of the crest of San Marino . Among other attractions of San Marino are the Basilica of the Saint, Church of San Pietro, where beds of Saints Marinus and Leo are, the Church of San Francesco, in which you can see the art gallery, the church of the Cappuccini and the State Museum of San Marino. On the main square Piazza della Libertà is the government building, which was recently renovated by architect Gae Aulenti. On this square are two state institutions of the Republic of San Marino - Parliament and the Captain-Regent. The entire historic center of San Marino fascinates with medieval atmosphere. The long history of San Marino and lengthy periods of peace have now made a small country and its capital to keep a significant number of works of art, including paintings by famous artists of the Italian Renaissance and Baroque styles. All over San Marino can be seen sculptures. Traditional crafts such as pottery and stone carving are practiced even today. The traditional cuisine of San Marino may not surprise you with something unseen, and pizza, pasta, lasagna, etc. are again honored. Chocolate lovers will be fascinated in San Marino, if you try a traditional pie "Torta tre Monti" (Cake of three mountains). It symbolizes the three castles in the higher parts of San Marino, this cake is made of soft and fragrant wafer, arranged in three layers. Among them, they put cocoa, cream and hazelnut cream and all that overflows with dark chocolate. Pride of San Marino is the cake "Titano", which is kind of sweet pastry with almonds and peanuts, eggs and honey.